One of the most popular posts here at Mama’s is How to Wash Stuffed Animals. It is in the top three most viewed posts every day. And while it offers good advice on how to launder stuffed animals, it doesn’t address those animals that can’t be submerged in water. So what stuffed animals cannot go through the washer? – Those with items that are glued on, such as buttons or a hat. Glued-on eyes will probably survive washing okay if you follow Mama’s instructions. If you have a most-loved stuffed animal that cannot go through the washer for a good cleaning, use the following guide to spot-clean it by hand. It’s not nearly as hard or time-consuming as you might think. I’ve tried washing stuffed animals using several different types of soaps (dish detergent and hand soap) but it works best to use an HE detergent due to its low-sudsing properties. Use only a white or very light colored towel to wash and dry your stuffed animals. A towel that is dark in color or hasn’t been washed a million times might transfer its color onto your animal. And then you’ve got a whole new set of troubles. So save yourself the headache and use white linens. 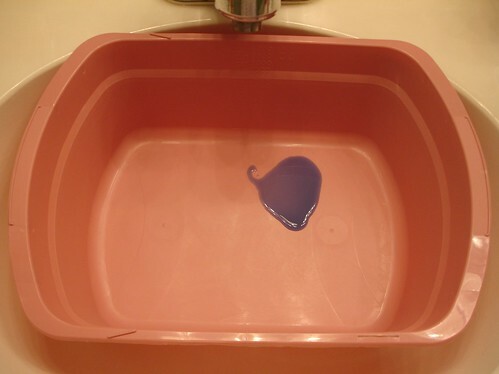 Depending upon the size of your bowl or basin, place a small amount of HE detergent in the bottom. There is only about a tablespoon in this basin. 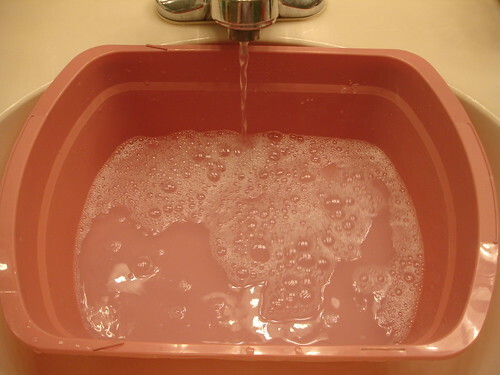 Fill the container with warm water, agitating the water as it fills the bowl so the detergent dissolves. 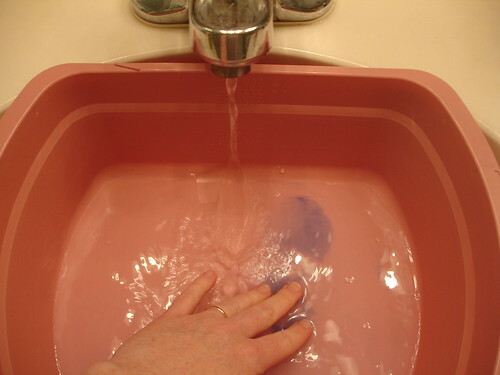 Dip your washcloth into the detergent solution and leave the cloth fairly wet, but not saturated. In a circular motion, very gently rub the outside of the animal. Continue washing until the whole stuffed animal is clean. If you have a problem spot or stain, dip the toothbrush into your detergent solution and very lightly scrub the stubborn spot. I will caution you that scrubbing any garment or stuffed animal with a toothbrush can cause damage. So only use a toothbrush for stains after you’ve tried to lightly scrub it with the washcloth. A toothbrush should be your last resort for a stain. Wet the other washcloth under cool, running water and again leave it fairly wet but not saturated. 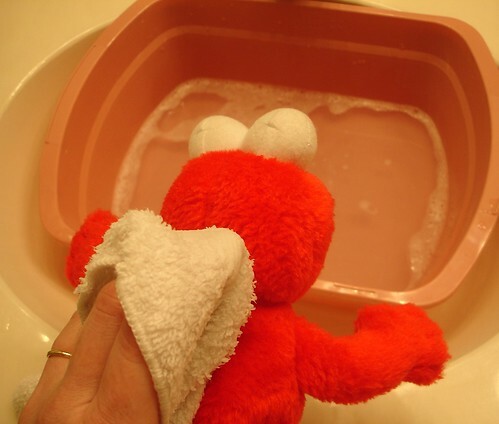 ‘Rinse’ the stuffed animal using the water-only wash cloth, gently rubbing in a circular motion. 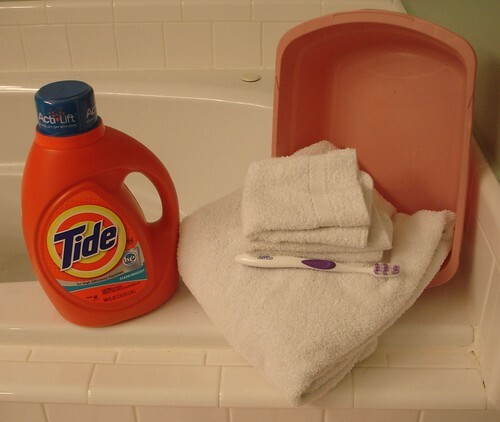 You might have to rinse this washcloth several times and wash again to remove the bulk of the detergent. 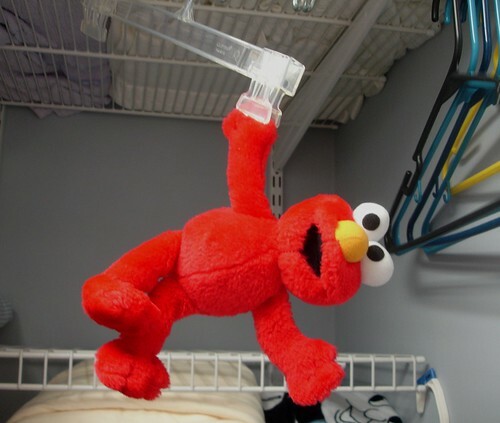 It is best to let the stuffed animal hang-dry or sit in front of a fan to dry. In all likelihood, if the animal is too delicate to go in the washer then it is probably too delicate for the heat of the dryer also. → Once a stuffed animal is cleaned in any fashion (washing machine or spot-clean) the nap (the baby’s fur) will probably never look the same again. While you are able to clean the animal, it won’t have that ‘brand-new’ look. Make sure your expectations are realistic about what the animal will look like after it is clean. → If you want to fluff up the nap of the stuffed animal, try lightly brushing or combing it. If you don’t have the results you were hoping for, you can put it in the dryer on the air cycle for a few minutes. Be extremely careful with the heat of the dryer. Delicate items cannot handle its heat and can melt quickly. You can also try drying it and fluffing it with a hair dryer. Again, be very careful with the heat of the dryer. → Don’t overdo it on the detergent. You want there to be enough detergent to be effective, but you don’t want so much that you can’t get the soap off. A dry soapy stuffed animal is a crunchy stuffed animal. For best results, use a high-efficiency detergent so the sudding won’t be as severe. Questions about washing stuffed animals? Feel free to leave them in the comments. We recently had issues with little unwelcome critters in our home and most of our stuffed animals can be washed in the washing machine. However my son has a teddy bear from Ikea that is positionable and I’m not sure how to wash it to make sure it is safe for my little one to play with. Any suggestions? Ashley, if they can take the minimal amount of heat, I’d dry on the lowest possible setting in the dryer. If they aren’t heat-tolerant at all, I’d set them in front of a floor fan and rotate them every couple of hours. My build a bear is around 13 years old and he literally means everything to me but hes SO dirty and I dont want him to fall apart, id be devastated. Should I hand wash him as you said or are there any other ways i can veryyyy gently wash him? We’ve always put them in a plastic bag and sucked out the dust with the baccuum cleaner. Katrina, yes, that’s a great fix for dust! Especially if you have a heavy-duty vacuum and not just a cheapy one. Unfotunately it won’t do much for stuffed animals that need a good bath, but it’s a great idea for dusty ones. Hello thank you for this information. I have a question and I’m unsure if you still reply to this post but I’ve got to try! So my sons favorite little bear is scented. He got it for Valentine’s Day and it smells like chocolate. I’m not sure if I wash him if his signature smell will go away so I’m nervous to do anything to it. But now he’s sick and it’s covered in dried snot and he needs a cleaning. Do you have any experience w a scented stuffy? Any thoughts would be much appreciated! Thank you! Hey Nic! How neat that it’s scented! I’ve never heard of that! But my guess is that any type of detergent would ruin that. Personally, I would spot clean it with diluted Tide or Dawn and a toothbrush, just on the snotty parts. Then “rinse” with a cold, wet white washcloth. Let it dry and then “fluff” if with a comb or dry toothbrush. I think that is probably your best bet.